Do you want to sneak some veggies in without anyone noticing? Use the sushi method of vegetable hiding. These carrot bites are so colorful and they look so cute. Who wouldn’t want to eat that? Even my son, the “I only like macaroni and cheese” guy, will eat these because they appeal to him. I made these carrot, cream cheese, and raisin bites to eat as a snack. Before I started writing this website, I would have just had the tortilla and the cream cheese (boring...). Adding the carrot not only makes it tastes better, it makes it much more healthy by adding fiber, vitamins, etc. Carrots are low in calories, high in nutrients, and very inexpensive. I purchased 2 pounds of carrots for $1.79 last week. This would be a great after school snack for kids or an after workout snack. Be aware that the entire tortilla cut up is going to set you back 200 calories so you might want to share this with a friend (or save half for later) if you are trying to keep your snacks to 100 calories. I would just make these and eat them because the wrap would get soggy in the fridge. How do you use carrots in your meals or snacks? 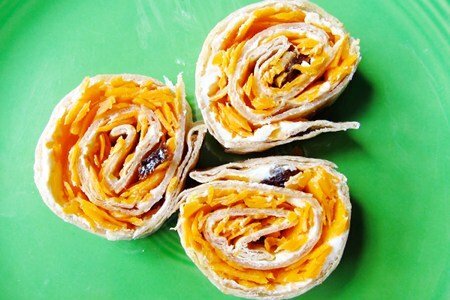 Spread cream cheese on tortilla. Add grated carrots and raisins and roll up. Slice into 10 pieces and enjoy! Thanks a lot for sharing this lovely recipe. Really nice idea. Love it!! Simple and tasty!! These look really good. I'm going to try it this week as a snack. I "sneak" shredded carrots into ground beef when I'm browning it for tacos, sloppy joes, etc. Yummy! These look great! What a good idea. This looks great and I think I will try this today with my kids. What a great idea! The perfect party platter treat! I love raw baby carrots, and making my own batch of Chick-Fil-A's carrot raisin salad: carrots, raisins, pineapple, and a little mayo, mmmm! Anyone have a suggestion for clean tortillas? Every package I read has a ton of ingredients! I'd love to find some that are just basic stuff. I know the Ezekial bread people make tortillas but I didn't think they tasted very good. I love their bread, but the tortilla just didn't work for me. Do you know of any good gluten free tortillas or wraps? The ones I've tried are hard to chew. @Melissa-- you can easily make your own with the flour you want to use. Most recipes recommend using flour, water, baking powder and a little Crisco to make it stick. I made some with just flour and water. For 4 cups of flour, use 2 TBSP of Crisco and 2 tsp of baking powder. Just mix it until you have a doughlike consistency, add a little salt to taste if you like, and roll to the size you want. Whole wheat ones made without lard tend to shrink up, so if you can mix whole wheat and white flour, that would be better. Just fry them in the pan until they brown a little and bubble on each side. I've been buying Las Fortunitas 100% Natural Whole Wheat flour tortillas from Costco (pkg of 40; I separate into stacks of 8 and freeze them). They are 110 calories, 3 g fat, 2 g fiber, 3 g sugar. They are tasty and very pliable compared to other whole wheat tortillas. I think the ingredient list is pretty clean (should be if they're calling them 100% natural). I think I'll have to try this snack for my boys. I've tried carrot-raisin salad before but they didn't go for it (even though they will eat all the ingredients separately!). Wraps/rolls might interest them. When I first made these last year I thought they tasted ... strange. But when I kept making them I realized that must mean I like them! My husband asked me if I was pregnant because it's such a unique combination of ingredients. @ Shari I also love Chick-Fil-A's Carrot Raisin Salad and make it at home.